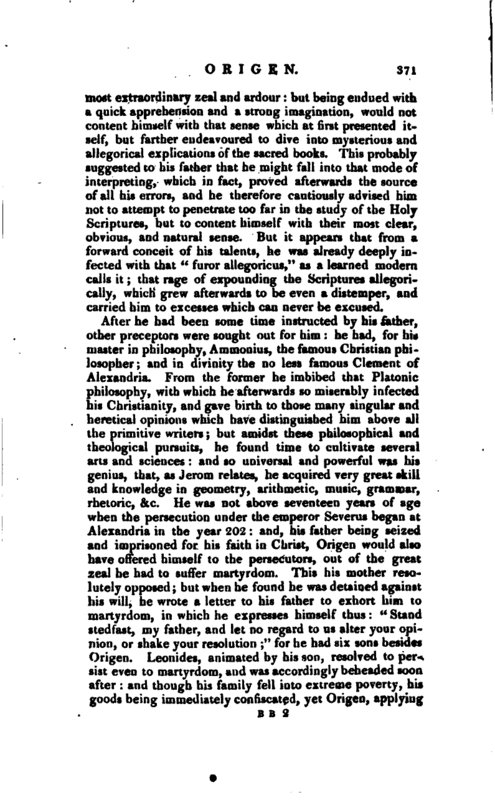 , an illustrious father of the church, and a man of great parts and learning, was born at Alexandria in Egypt about the year 185; and afterwards obtained the surname of Adamantius, either because of that adamantine strength of mind which enabled him to go through so many vast works, or for that invincible firmness with which he resisted the sharpest persecutions. Porphyry represents him as having been born and educated a heathen; but JEusebius has clearly proved, that his parents were Christian. His father Leonides took him at first under his own management, and trained him at home for some time: he taught him languages and profane learning, but had a particular view to his understanding the Holy Scriptures; some portion of which he gave him to learn and repeat every day. The son’s inclination suited exactly with the father’s design, so far as that he pursued his studies with | most extraordinary zeal and ardour: but being endued with a quick apprehension and a strong imagination, would not content himself with that sense which at first presented itself, but farther endeavoured to dive into mysterious and allegorical explications of the sacred books. 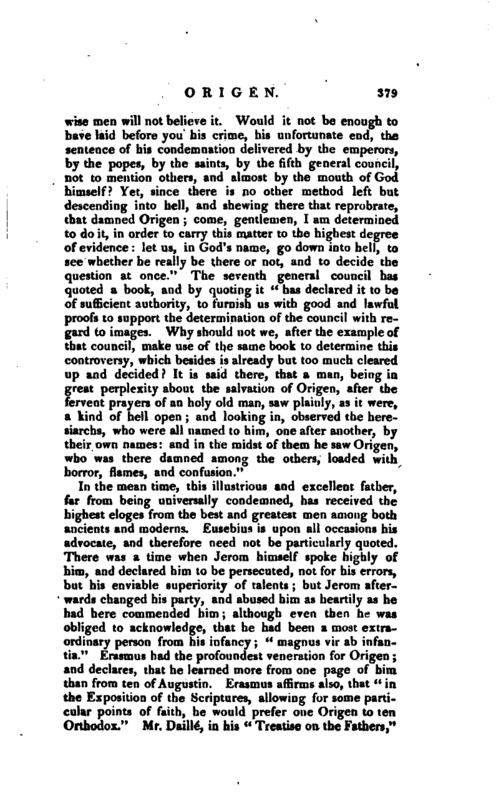 This probably suggested to his father that he might fall into that mode of interpreting, which in fact, proved afterwards the source of all his errors, and he therefore cautiously advised him not to attempt to penetrate too far in the study of the Holy Scriptures, but to content himself with their most clear, obvious, and natural sense. But it appears that from a forward conceit of his talents, he was already deeply infected with that “furor allegoricus,” as a learned modern calls it; that rage of expounding the Scriptures allegorically, which grew afterwards to be even a distemper, and carried him to excesses which can never be excused. After he had been some lime instructed by his father, other preceptors were sought out for him he had, for his master in philosophy, Ammonius, the famous Christian philosopher; and in divinity the no less famous Clement of Alexandria. 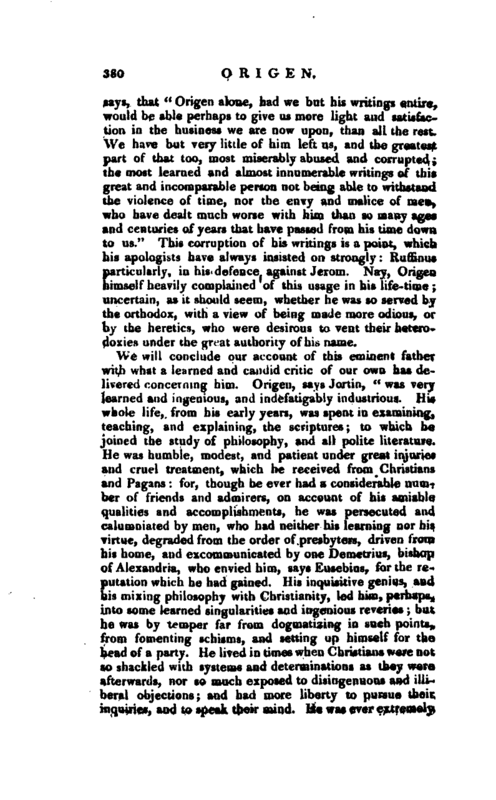 From the former he imbibed that Platonic philosophy, with which he afterwards so miserably infected his Christianity, and gave birth to those many singular and heretical opinions which have distinguished him above all the primitive writers; but amidst these philosophical and theological pursuits, ‘ he found time to cultivate several arts and sciences: and so universal and powerful was his genius, that, as Jerom relates, he acquired very great skill and knowledge in geometry, arithmetic, music, grammar, rhetoric, &c. He was not above seventeen years of age when the persecution under the emperor Severus began at Alexandria in the year 202: and, his father being seized and imprisoned for his faith in Christ, Origen would also have offered himself to the persecutors, out of the great zeal he had to suffer martyrdom. This his mother resolutely opposed; but when he found he was detaiued against his will, he wrote a letter to his father to exhort him to martyrdom, in which he expresses himself thus: “Stand stedfast, my father, and let no regard to us alter your opinion, or shake your resolution;” for he had six sons besides Origen. Leonides, animated by his son, resolved to persist even to martyrdom, and was accordingly beheaded soon after: and though his family fell into extreme poverty, his goods being immediately confiscated, yet Origen, applying | himself soon after entirely to human learning, by teaching grammar made a shift to maintain himself, his mother, and his brethren. 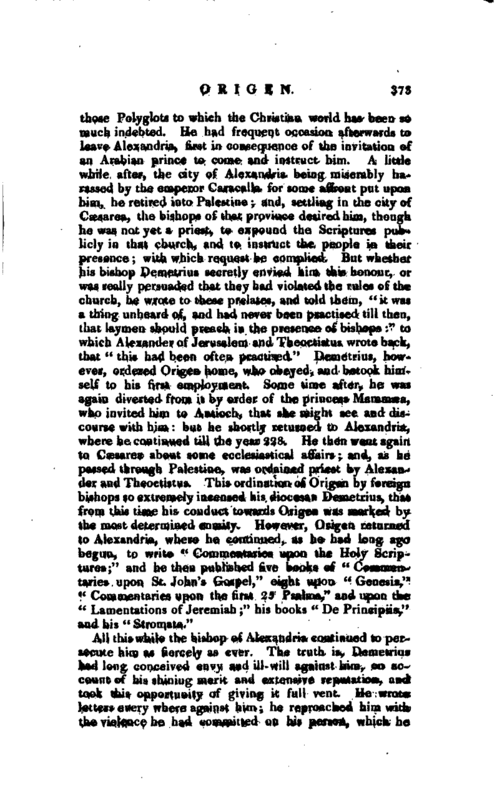 While he followed this profession, the chair of the school at Alexandria becoming vacant by the retreat of Clement, and by the flight of all those who were dispersed by the persecution, some of the heathens, who were willing to be converted, made their application to him, though he was not then above eighteen years of age: and at length, the reputation and number of his converts increasing every day, Demetrius, bishop of Alexandria, confirmed him in the employment of catechist, or professor of sacred learning, in that church. He then left off teaching grammar, and sold all his books of profane learning; contenting himself with a small daily allowance of four oboli, which were allowed him by the person who bought them. 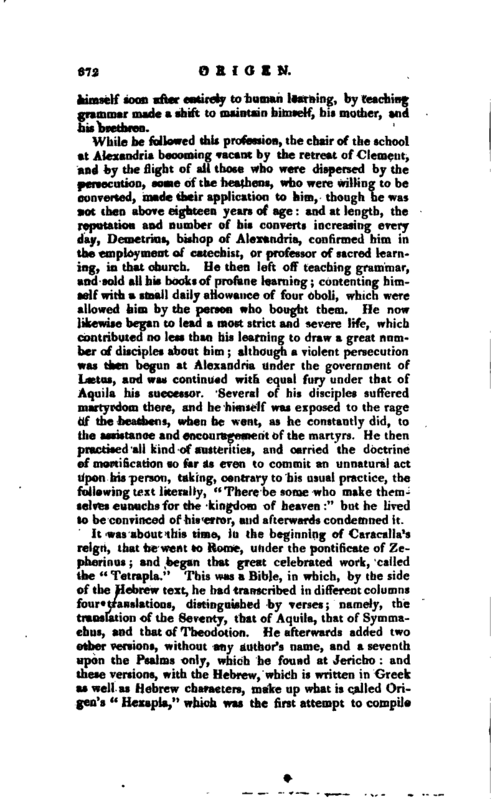 He now likewise began to lead a most strict and severe life, which contributed no less than his learning to draw a great number of disciples about him; although a violent persecution was then begun at Alexandria under the government of Lsetus, and was continued with equal fury under that of Aquila his successor. Several of his disciples suffered martyrdom there, and he himself was exposed to the rage of the heathens, when he went, as he constantly did, to the assistance and encouragement of the martyrs. He then practised all kind of austerities, and carried the doctrine of mortification so far as even to commit an unnatural act upon his person, taking, contrary to his usual practice, the following text literally, “There be some who make themselves eunuchs for the kingdom of heaven” but he lived to be convinced of his error, and afterwards condemned it. All this while the bishop of Alexandria continued to persecute him as fiercely as ever. The truth is, Demetrius had long conceived envy and ill-will against him, on account of his shining merit and extensive reputation, and took this opportunity of giving it full vent. He wrote letters every where against him; he reproached him with the violence he had committed on his person, which he | had formerly extolled as flowing from the greatest prudence, zeal, and piety; and in a council which he assembled in the year 231, it was ordained that Origen should not desist only from teaching, but even quit the city. Banished thus from Alexaiidria, he retired to Caesarea, his ordinary place of refuge; where he was kindly received by Theoctistus, bishop of that city, and by Alexander bishop of Jerusalem, who undertook to defend him, and commissioned him to expound the Scriptures publicly, hearing hiiii all the while as if he had been their master. The encouragement he received at Csesarea, seems to have exasperated Demetrius still more; who, not satisfied with the first judgment given against Origen, accused him in a council of the bishops of Egypt; and having caused him to be deposed, and even excommunicated, according to Jerom, wrote at the same time to all parts against him, to procure his being expelled the catholic church. 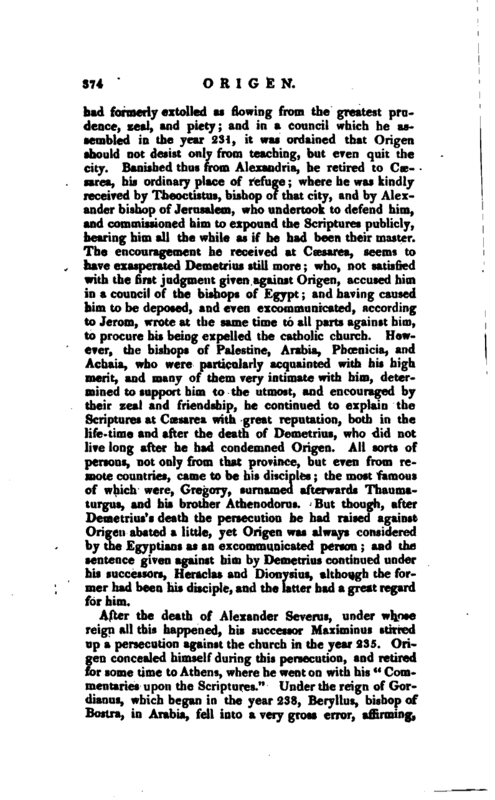 However, the bishops of Palestine, Arabia, Phoenicia, and Achaia, who were particularly acquainted with his high merit, and many of them very intimate with him, determined to support him to the utmost, and encouraged by their zeal and friendship, he continued to explain the Scriptures at Caesarea with great reputation, both in the life- time and after the death of Demetrius, who did not live long after he had condemned Origen. All sorts of persons, not only from that province, but even from remote countries, came to be his disciples; the most famous of which were, Gregory, surnamed afterwards Thaumaturgus, and his brother Athenodorus. But though, after Demetrius’s death the persecution he had raised against Origen abated a little, yet Origen was always considered by the Egyptians as an excommunicated person; and the sentence given against him by Demetrius continued under his successors, Heraclas and Dionysius, although the former had been his disciple, and the latter had a great regard for him. After the death of Alexander Severus, under whose reign all this happened, his successor Maximinus stirred up a persecution against the church in the year 235. Origen concealed himself during this persecution, and retired for some time to Athens, where he went on with his “Commentaries upon the Scriptures.” Under the reign of GorUianus, which began in the year 238, Beryllus, bishop of Bostra, in Arabia, fell into a very gross error, affirming, | that our Lord had no existence before his incarnation;’ upon which, some bishops gathering themselves together, caused Origen to come thither also; who convinced him of his error so effectually, that the bishop not only publicly acknowledged it, but ever after retained a kindness for Origen. Afterwards he was called, under the reign of Philip, to another assembly of bishops, which was held against some Arabians, who maintained that the souls of men died and were raised again with their bodies. 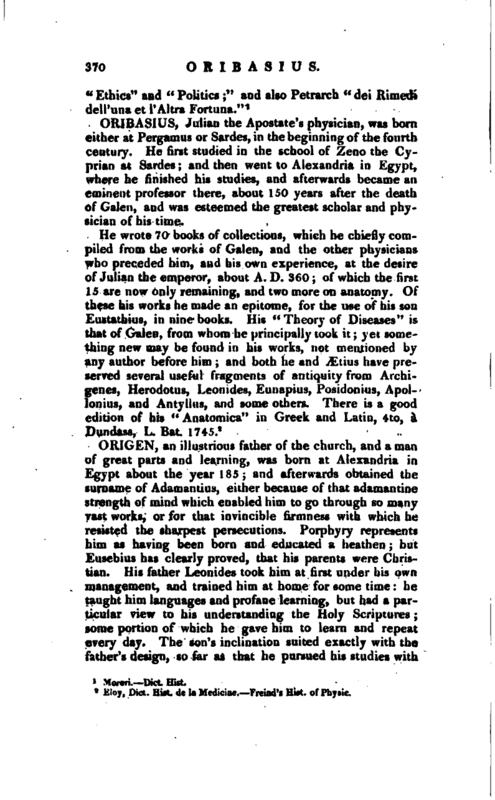 He was then about sixty years old, yet pursued his studies with his usual vigour; and not only composed several books, but preached almost daily to the people, and for the most part without any preparation at all, yet his discourses were so highly esteemed, that they were taken down from his mouth, and afterwards published. Under the persecution of Decius, he suffered with great constancy for the faith. He was seized, put into prison, loaded with irons, had his feet in the stocks for several days, where they were cruelly extended beyond their natural dimensions. He was threatened to be burned alive, racked with various tortures; but he bore all with resolution and firmness. Being released from prison, he held several conferences, and behaved in every respect like a confessor of Jesus Christ; and lastty, after having laboured so much, and suffered with such credit and glory, he died at Tyre, in the reign of Gallus, aged sixty-nine, according to Eusebius. Though what we have at present of the works of Origen made several considerable volumes, yet they are but an inconsiderable part of what he wrote. Jerom, speaking of Origen, says, “Who is there among you that can read as many books as he has composed?” We may distinguish his works into two kinds; the one upon the sacred Scriptures, the other into separate treatises upon different subjects. Not to mention his “Tetrapla” and“Hexapla,” which were rather a collection than a work of his own, he composed three sorts of books upon the Scriptures; and these were “Commentaries,” “Scholia,” and “Homilies.” In his “Commentaries,” he gave himself wholly up to all that heat and fire, all that genius and force of fancy, which was natural to him; the better, as he thought, to reach the height and depth of the Scriptures, and their most recondite and mysterious interpretation. His “Scholia” were, on the contrary, only short notes, to explain the | difficult places. These two kinds of works were rather for jthe use of the learned than of the people; but the “Homilies,” which the Latins call Treatises, and we Sermons, were moral lectures upon the holy Scriptures. We have none of the “Scholia” remaining, nor hardly any of the “Homilies” in Greek and those which we have in Latin, are ^translated by Ruffinus, and others, with so much licence, that it is difficult, if not impossible, to discern Origen’s own from what has been foisted in by his interpreters. A great part likewise of his “Commentaries” are lost. 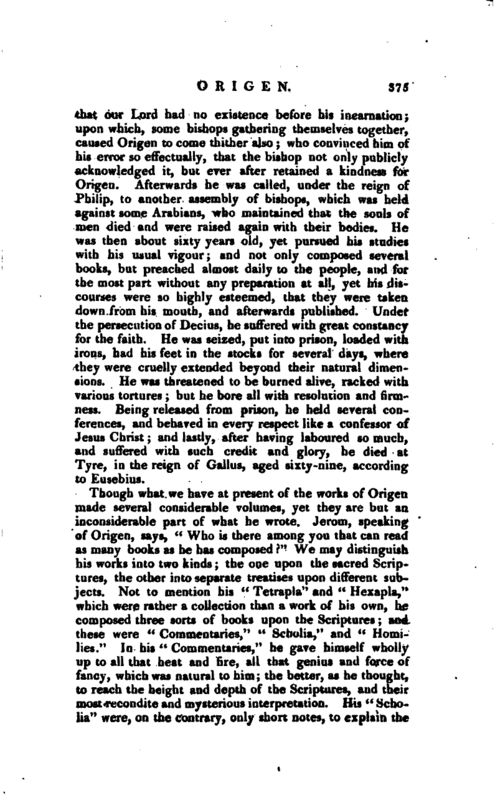 The other Treatises of Origen are not near so many in number as his works upon the Scriptures, and yet they were very considerable; for, not to mention his “Commentaries upon the” Philosophers,“which Eusebius speaks of, he wrote two books upon the” Resurrection;“a treatise” -De Principiis,“in four books; ten of” Stromata;“an” Exhortation to Martyrdom;“eight books against” Celsus;“”A Treatise upon Prayer;“’” A Letter to Africanus concerning the History of Susannah," &c.
All Origen’s works, which remain only in Latin, were collected by Merlinus, and afterwards by Erasmus, and printed at Paris, in 1512, and at Basil in 1536, in 2 vols. folio. Genebrard has since made a larger collection, which was printed at Paris, in 1574, 1604, 1619, 2 vols. folio. 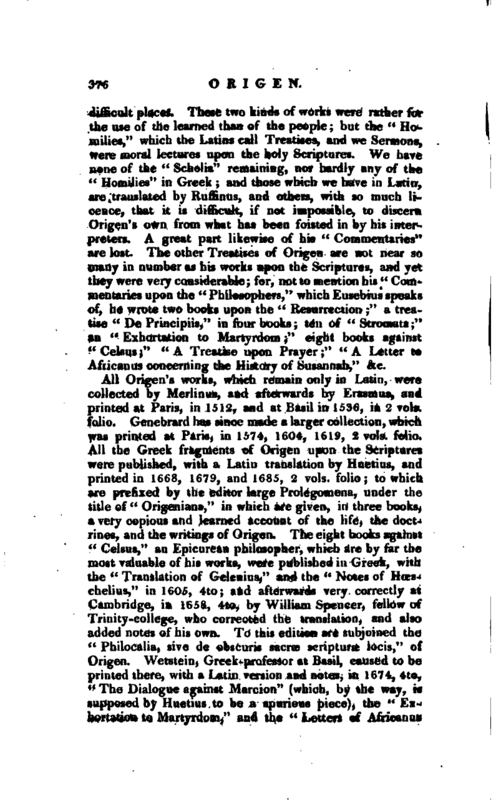 All the Greek fragments of Origen upon the Scriptures were published, with a Latin translation by Huetius, and printed in 1668, 1679, and 1685, 2 vols, folio; to which are prefixed by the editor large Prolegomena, under the title of “Origeniana,” in which are given, in three books, a very copious and learned account of the life, the doctrines, and the writings of Origen. The eight books against U Oelsus,“an Epicurean philosopher, which are by far the most valuable of his works, were published in Greek, with the” Translation of Gelenius,“and the” Notes of Hoeschelius,“in 1605, 4to; and afterwards very correctly at Cambridge, in 1658, 4to, by William Spencer, fellow of Trinity-college, who corrected the translation, and also added notes of his own. To this edition are subjoined the” Philocalia, sive de obscuris sacrse scripturae locis,“of Origen. Wetstein, Greek-professor at Basil, caused to be printed there, with a Latin version and notes, in 1674, 4to,” The Dialogue against Marcion“(which, by the way, is supposed by Huetius to be a spurious piece), the” Exhortation to Martyrdom,“and the” Letters of Africanus | and Origen, concerning the “History of Susannah and lastly, the book” De Oratione,“was published at London, in 1718, 4to, with notes by Dr. Ashton and Mr. Reading. 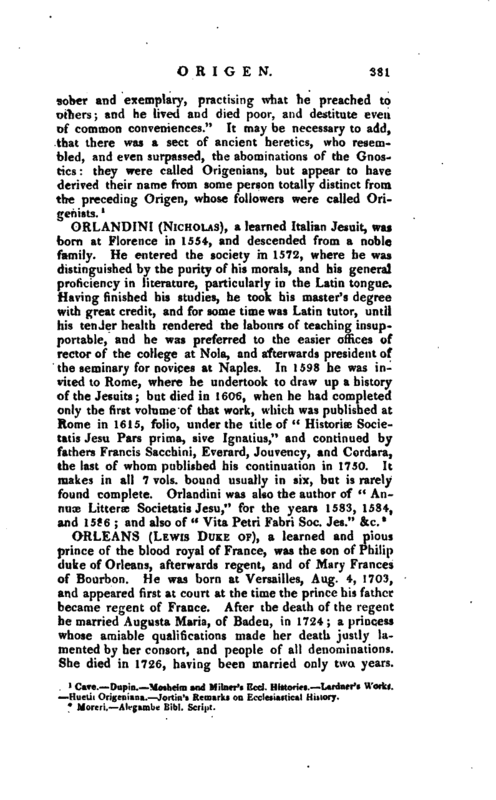 An edition of all Origen’s works was undertaken by Charles Delarue, a Benedictine monk, who began to publish it at Paris, in 1733, folio; and though the four volumes he has given us do not complete his plan, yet they contain the best, and indeed the only part of Origen’s works wprth any attention. 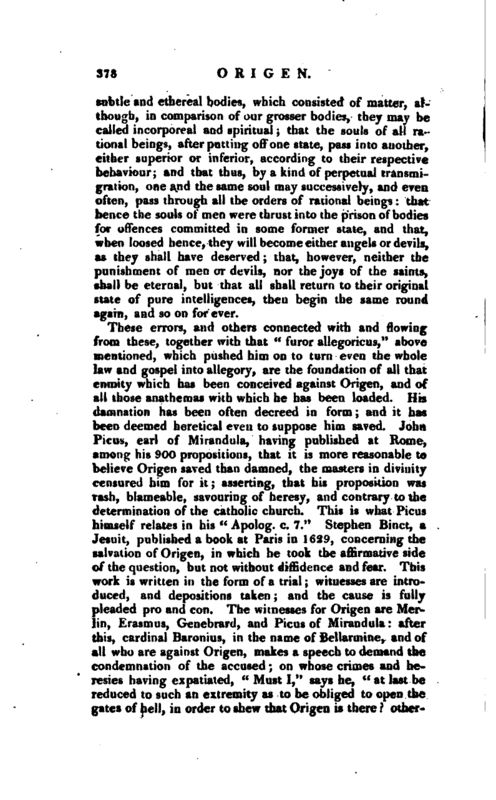 This was reprinted by Oberthur, in 1780, 15 vols. 8vo. The celebrated Montfaucon has published in 2 vols, folio, some remains and fragments of his” Hexapla," and more recently Bahrdt published at Leipsic the Hexapla, 1769, in 2 vols. 8vo. Ecclesiastical history, as Fabricius observes, cannot furnish another instance of a man who has been so famous, through good report and ill report, as Origen. The quarrels and disputes which arose in the church after his death on account of his person and writings, are scarcely credible to any who have not examined the history of those times. The universal church was split into two parties; and these parties fought as furiously for and against Origen as if the Christian religion had itself been at stake. 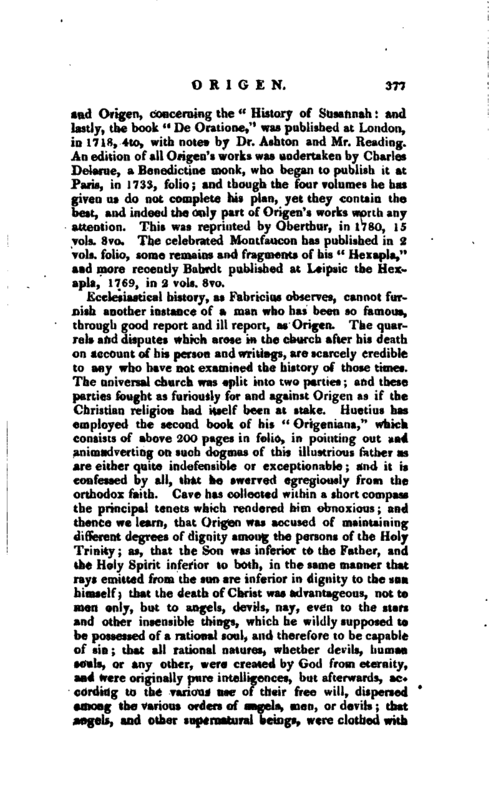 Huetius has employed the second book of his “Origeniana,” which consists of above 200 pages in folio, in pointing out and animadverting on such dogmas of this illustrious father as are either quite indefensible or exceptionable; and it is confessed by all, that he swerved egregiously from the orthodox faith. Cave has collected within a short compass the principal tenets which rendered him obnoxious; and thence we learn, that Origen was accused of maintaining different degrees of dignity among the persons of the Holy Trinity; as, that the Son was inferior to the Father, and the Holy Spirit inferior to both, in the same manner that rays emitted from the sun are inferior in dignity to the sun himself; that the death of Christ was advantageous, not to men only, but to angels, devils, nay, even to the stars and other insensible things, which he wildly supposed to be possessed of a rational soul, and therefore to be capable of sin; that all rational natures, whether devils, human souls, or any other, were created by God from eternity, and were originally pure intelligences, but afterwards, according to the various use of their free will, dispersed among the various orders of angels, men, or devils; that angels, and other supernatural beings, were clothed with | subtle and ethereal bodies, which consisted of matter, although, in comparison of our grosser bodies, they may be called incorporeal and spiritual; that the souls of all rational beings, after putting off one state, pass into another, cither superior or inferior, according to their respective behaviour; and that thus, by a kind of perpetual transmigration, one and the same soul may successively, and even often, pass through all the orders of rational beings: that hence the souls of men were thrust into the prison of bodies for offences committed in some former state, and that, when loosed hence, they will become either angels or devils, as they shall have deserved; that, however, neither the punishment of men or devils, nor the joys of the saints, shall be eternal, but that all shall return to their original state of pure intelligences, then begin the same round again, and so on forever. In the mean time, this illustrious and excellent father, far from being universally condemned, has received the highest eloges from the best and greatest men among both ancients and moderns. JEusebius is upon all occasions his advocate, and therefore need not be particularly quoted. There was a time when Jerom himself spoke highly of him, and declared him to be persecuted, not for his errors, but his enviable superiority of talents; but Jerom afterwards changed his party, and abused him as heartily as he had here commended him; although even then he was obliged to acknowledge, that he had been a most extraordinary person from his infancy; “magnus vir ab infantia.” Erasmus had the profounclest veneration for Origen; and declares, that he learned more from one page of him than from ten of Augustin. Erasmus affirms also, that “in the Exposition of the Scriptures, allowing for some particular points of faith, he would prefer one Origen to ten Orthodox.” Mr. Daille“, in his” Treatise on the Fathers,“| says, that” Origen alone, had we but his writings entire, would be able perhaps to give us more light and satisfaction in the business we are now upon, than all the rest. We have but very little of him left us, and the greatest part of that too, most miserably abused and corrupted; the most learned and almost innumerable writings of this great and incomparable person not being able to withstand the violence of time, nor the envy and malice of men, who have dealt much worse with him than so many ages and centuries of years that have passed from his time down to us." This corruption of his writings is a point, which his apologists have always insisted on strongly: Ruffinus particularly, in his defence against Jerom. Nay, Origen himself heavily complained of this usage in his life-time; uncertain, as it should seem, whether he was so served by the orthodox, with a view of being made more odious, or by the heretics, who were desirous to vent their heterodoxies under the great authority of his name. Cave. Dupin. Mosheini and Milner’s Ecd. Histories. Lardner’s Works Huetit Origeniana. Jortin’s Remarks on Ecclesiastical History.